Browse through our exclusive collection of ball fibre machines, which are extremely demanded in the quilting industries all over the Indian market. Trusted for their immaculate quality, sophisticated features and excellent operation, these machines serve the clients for long duration. These machines are cost effective in prices. The next generation fully computerised pillow filling machine which ensures a uniform and even fill, pillow after pillow, with minimal manpower of just one single operator, because of its unique load cell controlled weighing basket and vibrating table. 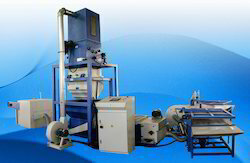 Sterling Introduces India’s first Fully Automatic PLC filling Machine for Pillows/ Quilts/ Comforters/ Bedding products. Clamping Cylinders ( 80 * 40 ) - 4 Nos. Butterfly Walve Cylinder ( 125 * 40 ) - 1 Nos.